It can be difficult to know what to do when you hate your job, but once the especially challenging days and Sunday scaries don’t seem to let up it may be time to explore your options. Making a job or career change can be an incredibly daunting task, but when considering the amount of time spent at work it’s important to listen to your gut and find a job that makes you happy. In fact, a University of Manchester study found that working in a job that makes you unhappy can even be more detrimental to your health and wellbeing than being unemployed, so you want to make sure you’re moving on for better and not for more of the same. Once you’ve come to the realization that you truly hate your job it’s important to dig deeper into what aspects are contributing to this overall bad feeling. It’s an old refrain that employees don’t quit jobs, they quit bosses—and that can certainly be a major factor in hating a job. If you don’t feel comfortable working with your supervisor or others in the leadership at your company it can ruin any of the aspects of the job you do enjoy. If you find yourself in this situation, it’s always a good idea to talk to HR and raise any concerns you might have and try to create a plan that improves your working relationship with your boss. Or, don’t be afraid to ask about changing your position in the company to work with a different team altogether. But even if your boss is supportive and you have a good working relationship, there may be bigger generalized problems with the company culture that have you looking at job postings. Common problems like a lack of work/life balance, never being able to ‘turn off’ from client fires, or even stagnant growth in the company can lead to a slow and painful realization that you have to move on. Unfortunately, changing company culture can be incredibly challenging for leadership to realize (high work output and profitability can sadly turn a blind eye to staff well being) and it’s a long process to reap the benefits of real, sustained change. It’s certainly still worth speaking up when these warning signs start to arise, even if you end up finding a new job you may be making life easier for new hires down the road. While company culture can be hard to really identify in an interview process, you should feel empowered to ask hiring managers or your eventual supervisors conducting the interviews about some of these common company culture problems (“Do you feel like you have a good work/life balance?” “How often does staff typically work late nights or weekends?” “How long have you been with the company?”) If you go to any in-person interviews, ask for an office tour and take note of how the general office vibe — are employees talking and socializing, or are they mostly silent working heads-down at their own desks? Beyond asking directly, you should also look for reviews of the company on Glassdoor to hear from real people who have worked there on what their experiences were like. Now, what if it’s the clients or projects the company brings in that are causing you to pull out your hair? It might be the case that your company’s SOWs or workflows need to be improved to better protect you from scope creep or other common issues that can cause client-PM frictions. Make note of the common issues you’re hearing (from the clients or from your team) and see where proposals or workflows can be updated to start managing expectations before work begins and keep the project road less bumpy. You can also ask to shift projects or accounts to other team members if you think it’s just a personality clash and another co-worker might have a better relationship. If the client is maybe too difficult to work with, you can and should escalate this and ties might need to be severed completely from your company. If the job is killing you, no matter the specific client, you may want to work at a smaller (or larger) agency that works with a different general caliber of client. You can also look for mission-driven or specific niche agencies that have clients and projects that you’re interested in and get you excited about the work. 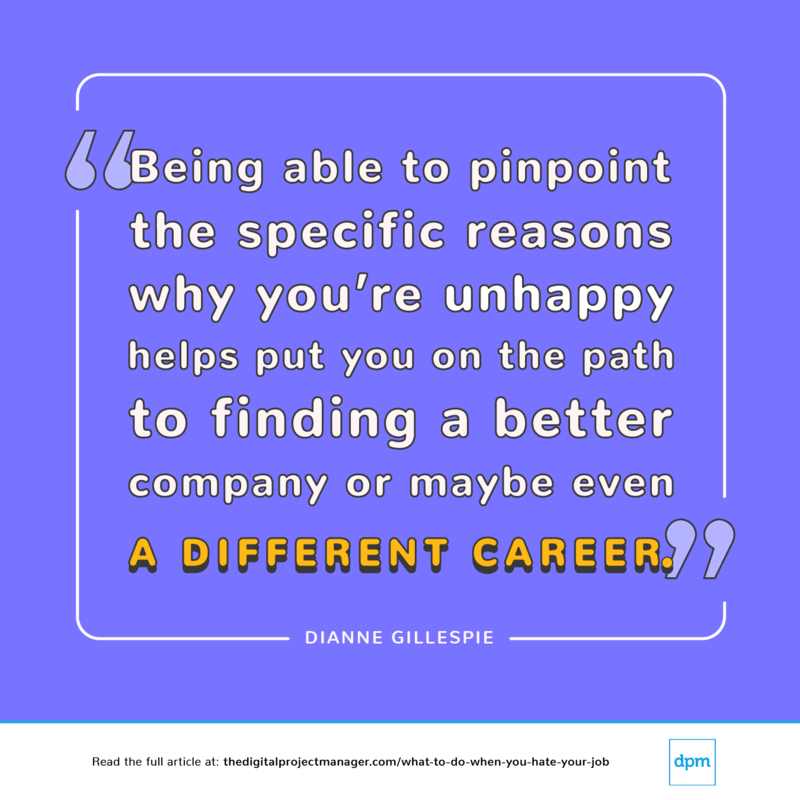 Maybe you can’t pin your unhappiness on the company or the clients and it could be the role itself that isn’t really the right fit. Project Management requires a lot of hard skills and soft skills and certainly a lot of mental gymnastics to keep all the moving parts balanced. You can start by identifying where you think your essential Project Managements skills lie and where you think you can focus improvements to make your day-to-day easier — more success often leads to less stress. You can also start to self-assess where you think you’d want to beef up your skillset. Maybe you’re really great at planning, organization and really enjoy talking to stakeholders and running calls but you want to know more about best practices in UX Design or understand more of your Developer’s way of thinking and assessing project goals to support them better — find something that you think you could know more about and let yourself get curious! You can also sign up for Digital Project Management School if you’re just starting out in Project Management or want to brush up on skills and learn new approaches. Some of the aspects of the role might be what drew you to this position, but if you find yourself hating other aspects or they’re more challenging than you want in a job you can take the skills you do have to a different career path. Fortunately, many of the skills PMs require are incredibly transferable and sought after – so even if you don’t feel the full bundle of a DPM role is right for you, you can take what aspects you feel confident in and jump in to a new career with that insight and experience. If you’re looking to cut down on interfacing directly with clients, product management might be a better fit and relatively easy to transition into. Or, perhaps a more active business development role if you’re excited at meeting and bringing in new clients but start to lose interest in the life cycle of the project itself. Outside of the digital sector, maybe try your hand at events planning, accounting or becoming a hiring recruiter – being able to keep track of many moving pieces and stay organized gives you an advantage in almost any field. Has all of this been ringing too true to your current experience? There are definitely options you can exhaust before choosing to quit your job, so don’t be afraid to speak your mind and try to make your current situation work for you. However, a fresh start at a new job also provides a lot of opportunity to negotiate a better situation from the outset. What have been some of the clear warning signs that made you find a new job? If you have any stories to share, let us know at Dear DPM! Or if you have any suggestions on how to ask for change that’s left you excited to sign in to work again – we’d love to hear them! There’s a good chance other members of our community have been through similar situations and came out ahead — and sometimes all you need is a safe space to vent. Dianne Gillespie has been managing award-winning digital projects for five years in the political and non-profit sphere, as well as enterprise level accounts for large content publishers and companies. She is currently a Senior Project Manager at 10up living in Brooklyn, NY.